adidas and the Boston Athletic Association (B.A.A.) are celebrating their 20-year partnership with a contract extension that keeps the brand as the Official Supplier and Outfitter of the Boston Marathon for years to come. Looking forward, adidas and the B.A.A. will be together for the B.A.A.’s 125th anniversary in 2013, and the historic 125th running of the Boston Marathon in 2021. This year, adidas will again supply the coveted official Boston Marathon jacket and will outfit more than 10,000 race volunteers, media members, medical personnel, race officials and staff. In addition, the extension expands on the adidas role to include exclusive rights to manufacture, distribute, promote and sell B.A.A. branded apparel. When adidas first sponsored the Boston Marathon in 1989, the race had 6,458 entrants; this year it will have 26,400. The B.A.A. and adidas will continue to create comprehensive and proactive community outreach programs to serve and promote sports in the city of Boston. Currently, the two entities partner on programs such as clinics for Boston-area runners throughout the year and the B.A.A. Kid’s Relay Challenge, conducted over marathon weekend. adidas running product will be on sale at the adidas booth at the John Hancock Sports & Fitness Expo inside the John B. Hynes Convention Center and at local Boston retailers including Marathon Sports, City Sports, New England Running Company and the Greater Boston Running Company. The full line of product can be purchased online at www.shopadidas.com. In celebration of the 20th anniversary of the original partnership and the running of the 113th Boston Marathon, adidas designed a limited edition B.A.A. Supernova Sequence 2 running shoe. The limited-edition shoe features a unique colorway with the iconic B.A.A. unicorn logo. Only 800 pairs of the shoes were created. The shoes retail for $100 and are available at the Boston Marathon Expo, Marathon Sports, City Sports, New England Running Company, the Greater Boston Running Company and www.shopadidas.com. 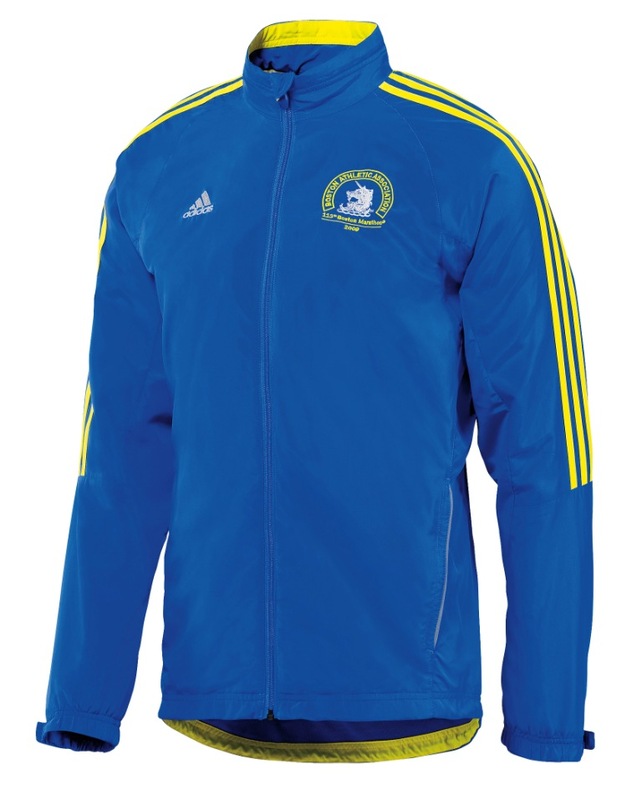 All runners should have the chance to show off their accomplishment and adidas and the B.A.A invite them to do that with the Official Race Jacket of the 113th Boston Marathon. Featuring ForMotion apparel technology that optimizes performance and fit, this jacket offers greater comfort and freedom of movement. The ClimaProof lightweight shell allows heat and sweat to evaporate while keeping cold air and wind away from the body. The jacket retails for $90 and is available for men and women. For the first time, Marathon finishers will have the chance to create a personalized t-shirt after the race through adidas and partner SpreadShirt.com. Finishers can visit the site to select from various colors and styles and also can incorporate the official B.A.A Marathon logo as well as their finishing time on select designs. adidas is a global designer, developer and marketer of athletic footwear, apparel and accessories with the mission to be the leading sports brand in the world. Brand adidas is part of the adidas Group, a corporation that also includes Reebok, TaylorMade and Rockport. Some of the players in adidas’ roster of athletes include: Kevin Garnett, Dwight Howard, Jeremy Wariner, Allyson Felix, Shawn Johnson, Candace Parker, Reggie Bush, Tim Duncan, Ryan Howard and David Beckham.